USADA announced today that Val Barnwell, a Masters track and field athlete, has received a sanction for testing positive for a banned substance at the 2009 Masters World Championships in Lahti, Finland. Barnwell, 52, of Brooklyn, N.Y., tested positive for testosterone prohormones in a sample collected from him on August 3, 2009, after winning a gold medal in the 200 meter event at the Masters World Championships. Testosterone prohormones are prohibited as Anabolic Agents on the World Anti-Doping Agency Prohibited List, which has been adopted by the USADA Protocol for Olympic Movement Testing and the International Association of Athletics Federations (“IAAF”) Anti-Doping Rules. member, American Arbitration Association/Court of Arbitration for Sport (“AAA/CAS”) panel, which heard evidence during a February, 25, 2010 hearing. 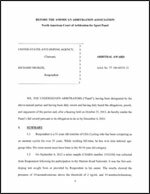 The panel, in an Interim Order issued on February 26, 2010, found that Barnwell had committed an anti-doping rule violation for his use of testosterone prohormones and that no exceptional circumstances justifying a reduced sanction were present. The panel’s full written decision will follow, including a reasoned award, and will be posted on the USADA website upon issuance. In its Interim Order, the panel issued Mr. Barnwell a two-year suspension beginning December 11, 2009, the date he accepted a provisional suspension.